When running the Antimalware Activity Report, the Malware Activity section of the report failed to run and showed the error “Subreport could not be shown”. The environment is System Center Configuration Manager (SCCM) 2007 R2, Forefront Endpoint Protection 2010 and SQL Server 2005 SP4. To apply the startup parameter, open SQL Server Configuration Manager under Microsoft SQL Server 2005 -> Configuration Tools on the start menu. Right-click on the SQL Server service, choose properties and open the Advanced tab. 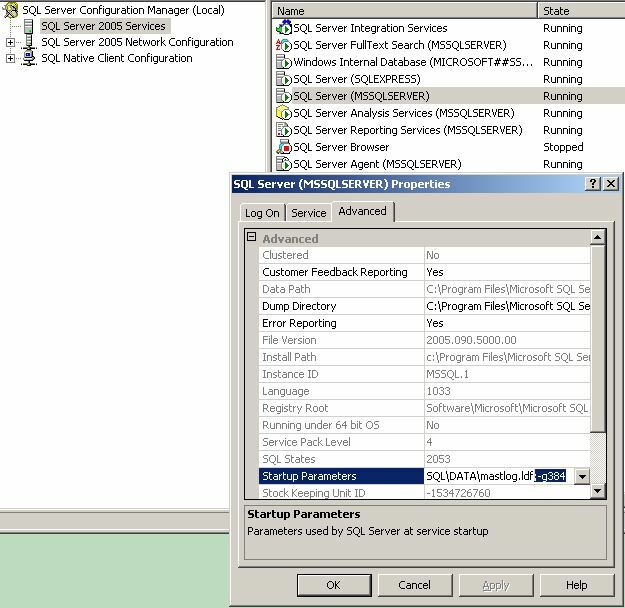 Add ;-g384 to the end of the existing startup parameters and restart the SQL Server service. This entry was posted in System Center Configuration Manger on May 9, 2012 by richardstk.